It's that time of year that i throw money at a new ebike product and test it to see if it lives up to the hype..
A couple members here mentioned that a few companies were offering 1500w rated hub motors for sale and i had to investigate. These 35mm stator motors.. so they would be similar in dimensions as the Crystalyte HS35xx series of motors. Stated efficiency seems to vary per vendor.. from a maximum of 80% to a maximum of 90%. Here is the data on their new motor. So, i have ordered up the motor.. i asked for a 24mm internal width rim and they spoked it up at no additional cost, so that's cool. It's in transit and i should get it in a week or two. Worst case scenario: This company is full of crap and it's really a 80% efficient motor. The motor is still useful, but i will talk crap about them eternally. The axle may be actually be 142mm since many of these companies aren't honest about that... we'll see. Best case scenario: looking at the spec sheet, this motor's power would be understated by quite a bit. At 2000w input, it should be making around 200w of heat; that seems like a sustainable constant power level. I have something that is almost as powerful as a Crystalyte HS40xx and i pay myself on the back for being a first adopter. If you order the default winding, the 4T..
For a 26" wheel, you will want a controller and battery capable of pushing 60 amps continuous during acceleration or hill climbing in order to hit the top speed of the motor and have decent torque. 60A x 48V = 2880W peak. Your continuous wattage at 100% speed will be about 2000W, or approx. 41A continuous. You'll want nothing smaller than a 12FET 4011, or preferably 3077 FET controller in order to do this. I run an 18FET 4011 controller myself with this winding, because i wanted large amounts of thermal overhead, as i run about 90-100 amps. Even the 12FET 3077 ( lowest resistance FET type is the 3077 ) would get hot on 80A. For this winding, i would use either a RC Lipo type pack above 20AH or A123 pack around 20AH as well in order to deliver the needed current. 20C Lipo would work. If you want something other than the two above chemistries, you're going to need 40-60AH worth most likely, if you're dealing with a 2C-5C chemistry. 1C is out of the question unless you can figure out how to jam 50-60AH into the triangle. The 4T is an amp guzzler, not a volt guzzler..
hopefully you will get the 205 / 35H motor on the latest sheet. this looks not bad. I just got the leafmotor 1500w model in the mail today and pulled it apart just now.. 0.35mm laminations, very tight windings ( way better than the 9c/crystalytes i've seen, 35mm wide stator, and it fits into a 135mm dropout. VERY IMPRESSED.. all signs point to this motor being more powerful than the crystalyte 35xx series and magic pie. More pics and data later! Looking at those charts its great to see it has listed Nm (newton meters) for torque ability, I shouldn't pretend to be some kind of knowledgeable motor guy but a little while ago I went nuts trying to chase up these kinds of charts on motors and most don't list Nm or any kind of torque numbers which is really annoying. For me just seeing some Nm numbers displayed inspires a lot of confidence. Sorry to hang my ignorance out there, but can someone please explain this chart to me? Or point me to a thread or URL where there's an explanation? 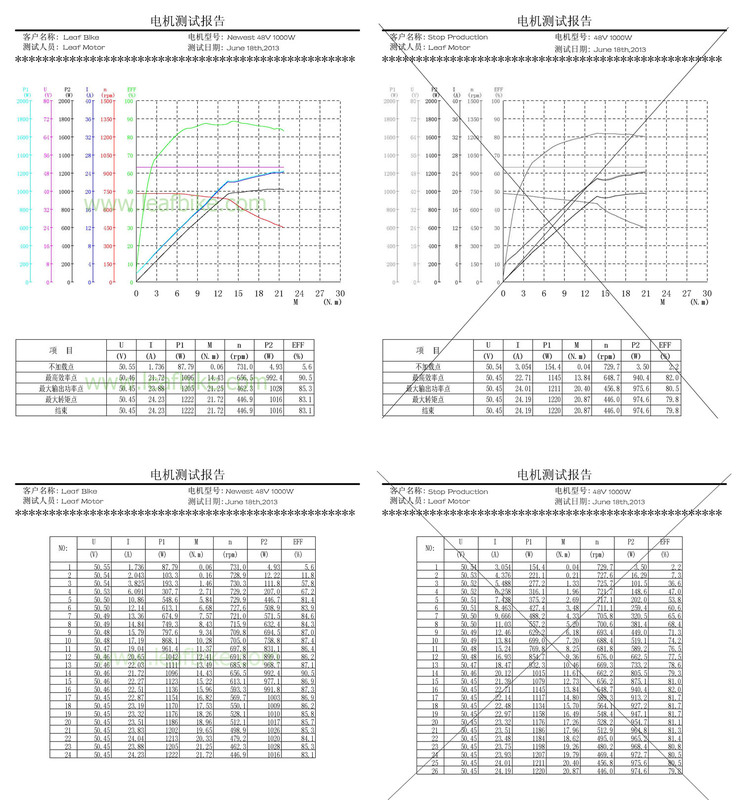 Got this chart in my inbox this morning for the Zhenlong 1500 watt motor and first time I've cared what it means. That motor is horrible. 77% peak efficiency is awful; the worst i have seen for a direct drive motor. 1500w peak power is not a nominal rating. It's more like a 1200w (or less) motor. Do not buy. I asked for a 24mm internally wide rim, and they certainly delivered.. spokes look like 12-11 gauge. Axle is about 8.5 inches or 215mm wide. Came with 2 extra spokes and some fuses, etc. Nice touch. I had to know... are these laminations actually 0.35mm or not..
Nice stator construction.. windings are also fairly flattened. Within a rounding error of being 35mm wide.. okay! Yup, 0.35mm laminations it seems.. I couldn't get a really accurate measure here, but it appeared as if the magnets were just a tiny bit wider than the stator. There is a bit of a gap in the magnets..
7.94kg for the entire wheel.. nuts, disc brake bolts and all.. so, about 17.5lbs in total. I'd imagine that the hub weight is about 16lb. 645rpm / 49v = 13.16kv and about 95W no load. The wheel was bouncing up and down a lot due to the wheel being out of true ( typical china build ), so the real no load might be more like 90w. This is impressive for a 35mm wide motor, actually. My memory is fuzzy, but i remember my MAC 8T no-loading at ~150W and the Crystalyte HS3548 no-loading at a similar wattage. I feel good about this motor, though the wheel build is hilariously off.. so i've sent it to the local bike shop to get trued. How does it compare to a mxus? Don't own a mxus, haven't even had a single ride with the motor yet.. settle down over there.. It goes to the question of professional evaluation of hub motors. There is a significant growth of interest and adoption. So companies in China are building capacity. This will not be the first time that a Chinese company comes online at Alibaba with product. What I'm asking for is methodology for competent comparative analysis. If you have some additional tips, that would be great. For instance, what are the range of efficiency values across a range of motors? Do you have a particular controller in mind? There's no reason specific to this motor that you'd need a sinewave controller. Anyway, i hooked this up to my turner full suspension bike and a 3077 9FET infineon-type controller from cellman on a saggy 12S Lipo battery cranked the controller up to 45A and 100 phase amps for a ~2.22:1 phase:battery amp ratio. Initial torque was a bit sluggish, but once you got the motor to about half speed, the power started kicking in. Then i tuned it to 45A & 120 phase amps for a 2.6:1 ratio and the acceleration improved considerably.. this confirms something i've known about high speed windings - you're gonna need a high phase amp ratio to get the motor rolling. I would have tried a 3:1 phase amp ratio, but the 9FET was already getting rather hot. So i pushed the bike up and down 10% grades a few times at 2000w with no pedaling. At the end of a few miles of this, the motor felt like it was maybe a few degrees above ambient after this abuse. I didn't have a speedometer set up just yet, but could tell that i was running at around 35mph on the flat sections because the water was being swept away from my eyes. So the preliminary, not so scientific judgement of this motor is that yes indeed, it is rather efficient and powerful despite being driven lightly and through those tiny little 18gauge phase wires it comes with. I have a 12FET 3077 controller coming that i plan on running at 65A and 180A phase amps, to push this motor up to 3000w nominal. Then i will actually gather some videos and figures etc. I will be following with much excitement! So did you get the 731rpm/3 turn one? No of course there is no need for a sine wave controller with this motor, but it would be sweet because the closer you can get to %100 motor/controller/battery efficiency the way better. Mate that with a recumbent bike, ceramic bearings, light weight and high psi low drag tires for the ultimate in performance and efficiency. Anyway it's really nice to have someone with experience putting this motor through the ringer and opening it up and everything. O and when I was emailing them they said they were 2mm wires so this equivalates to about 14 AWG. Unless they were lying to me. * Phase wire is 2.0mm.Because no enough room to put thicker wires. * If possible,we also can make wire to be 4mm.Need to modify axle.If we modify axle,we also need to use other cover to make it. (the bearing is bigger).But the spacing of front motor will more than 120mm,the rear hub motor will be about 155mm. HOLANDIA BEACH CRUSER 1000W 9C ?TURN REBUILDING... no thread yet. As i stated a bit above.. My winding = 645rpm / 49v = 13.16kv and about 95W no load. I am wondering if i can order a stator with an additional turn. Leafbike does have a stator winding item for sale on their webpage, so maybe this is possible. But i do like this winding as it is..
Nep, those wire cutter are not made for feflon coated wire, where insulation is minuscule. 36awg teflon wire is about1/3 in the diameder to regular vinil? insulated wire (with insulation) . To make sure, I measure strand D then calculate area times N of strands. You may be surprised at the end. Keep the updates coming, Neptronix. Para, you're probably right, but i cut the wires with the 18ga. setting and replaced the wires with 12 gauge anyway. The 12 gauge looked like double the width. I just have to finish the disc side torque arm tomorrow, hook up & calibrate the cycle analyst, and i'm good to start doing some real tests. Should be a nice 60 degrees here in Utah for the next few days, and my arthritic joints have been being nice to me so you'll hear back from me soon for sure. It was just me trying to screw the party. I always do same thing cutting those wires anyway. Have fun and report back! Thanks for sharing some of your tricks and real world experience! How are you doing your torque arms? awesome find! I like it for having such high KV. Really makes it usable at 48V. Only the phase wires and the missing thermistor need some treatment. Are the phase wires easy to change? like with the crystalytes and MagicPies where you just have to get the bearing out and new wires installed? I'd like to test the DrBass method using flat desoldering bread as phase wire. The thin lams make it also a candidate for middrive single reduction setup like bzhwindtalker once did: the LMX. Maybe it runs fine in Delta termination, too (22.5kV would be a NUMBER!!)? Guess it is terminated in star like all DD hubs? Cross: the phase wires come out before the axle touches the dropouts, kind of like how a crystalyte is set up. I don't know how easy modifying the phase wires from inside the hub would be. I found that after my test ride at 3000w, the section of original phase wires i'd left ( about 2 inches ) wasn't even hot or warm to the touch. Dudes, this motor is the real deal. I just pushed it up the 8% grade test hill again a few times on 65A batt, 173A phase. ( about 3000W ) The 12FET 3077 was extremely hot at the end of this run ( it is sitting in a frame bag though, which does not help ). The motor was barely warm to the touch, i was amazed. I was running it at around 3000W continuous and it barely flinched. I hit 38mph on a slight ~-0.25% grade in 100% mode, and 44mph up that ~0.25% grade in 120% mode. I would compare this to my magic pie, except i don't know the limits of the motor just yet because the controller can barely hang. I would say that i get more power per watt inputted for certain than the magic pie. This motor would be a crapton of fun if you were to order it up with a stator that had an additional turn on it and ran it at 72v. Last edited by neptronix on Mar 12 2015 3:49am, edited 1 time in total. Reason: note about the controller being in the frame bag. I sent an email asking leafmotor about getting a stator with another turn on it.. i just have to know how she rolls on 72v!